So far this week, this weather has been hot and sticky. It reminds me of childhood years in Maryland. However, in Maryland, our house was air-conditiioned. In Boston, air-conditioning in my life is limited to the car and the office. Sure, I know, we could buy an air conditioner. We actually have a window unit, but it’s in the closet. It seems like the weather always breaks before we set it up. We’re managing with the house fan, ceiling fans, and lots of window fans. On a humorous note, the humidity has been so high that my curly hair is an inch or two shorter than usual. I look a little like a Brillo pad. Howard grilled the salmon with our favorite seasoning for fish: Trindad Style Lemon-Garlic Marinade from Penzey’s. It’s actually a rub, not a liquid. I just love it on grilled fish, especially salmon. 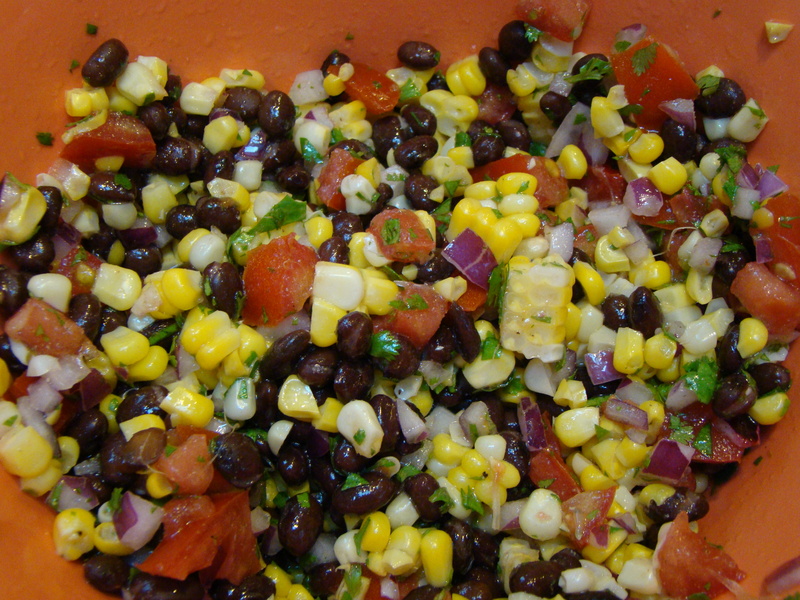 I didn’t want to make the kitchen any hotter, so I put together a black-bean salad that required no actually cooking, just chopping and mixing. The grilled fish with bean salad and a big green salad made for a refreshing summer dinner. We even had enough salmon left over for a pseudo-Nicoise salad the next day for lunch. I started with salad greens, chopped tomato (hothouse), and Kirby cucumber that we brought back from the local farmstand in Maine. I added shelled raw peas from our garden. I briefly microwaved the leftover fish and some leftover steamed potatoes. Then, everything was tossed together with some tarragon dressing. Voila! Easy lunch. Tonight, I did use the stove to make orzo with mustard greens, another successful recipe from NoTakeOut. Other than boiling the water for pasta, everything else was just chopping, and once the pasta was cooked, everything else was combined off the heat. To make the dressing, whisk together the lime juice, olive oil and cumin. Season to taste with salt and pepper. Toss the remaining ingredients together in a large bowl with the dressing. Serve at room temperature or cold.